Budapest, Gödöllö, Eger, Héviz, and more! Stunning architecture, vital folk art, thermal spas and Europe's most exciting capital after dark are Hungary's major drawing cards. Hungary’s scenery is more gentle than striking. But you can’t say the same thing about the built environment across the land. Architecturally Hungary is a treasure trove, with everything from Roman ruins and medieval townhouses to baroque churches, neoclassical public buildings and art nouveau bathhouses. Hungarians have been 'taking the waters' supplied by an estimated 300 thermal springs since togas were all the rage and Aquincum was the Big Smoke. They still do – for therapeutic, medicinal and recreational purposes – but the venues have changed somewhat. Budapest has a very lively gay scene. The past decades have brought a great deal of general tolerance as well as possibilities for gay people. As a result, the city now has arguably the best gay scene in Central Europe. Budapest is becoming a more and more popular destination for tourists, including gay people, straight people or anybody in-between. Besides its thermal spas, abundant historical monuments and exquisite architecture, Budapest is now also famous for its animated gay party scene. 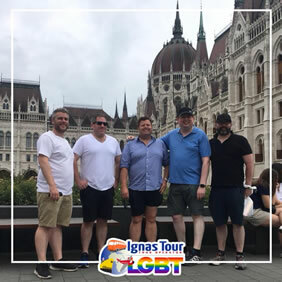 Budapest has a constantly increasing array of clubs, bars, gay-friendly restaurants, saunas, cruising areas, drag shows, as well as underground and mainstream parties. There are two saunas specifically designed for gay people: Magnum and Szauna 69. Both are very well equipped with everything you need to relax and do some cruising. There are all kinds of people there and discounted entry prices on certain nights. Budapest has two specifically gay-friendly restaurants: Club 93 Pizzeria and Why Not Bistro Budapest (Belgrád rakpart, close to Why Not? Cafe & Bar). Both offer delicious dishes and excellent service. Why Not Bistro is a gay friendly restaurant directly on the bank of the Danube, and its terrace offers an amazing view of the Gellért Hill. 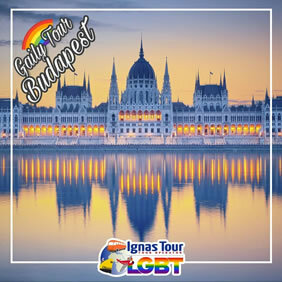 • Buffet Breakfast and start your tour together with our Gay/Lesbian Guide from the first side of Budapest, Pest. • Start from the historic downtown of Pest where you will visit the Hungarian State Opera House, a neo-Renaissance opera house, Deák Square, Váci Street, one of the main pedestrian area and perhaps the most famous street of central Budapest, and the Great Market Hall with its over 100 market stalls and endless choices of regional products. • Finally reach the imposing Hungarian Parliament Building, a magnificent example of Neo-Gothic architecture and considered among the most beautiful parliaments buildings in the world. Enjoy this special tour and admire the most important building of the city. • Afternoon free for individual visits and shopping. • Dinner on your own and overnight at your hotel in Budapest. • Buffet Breakfast and departure by private car or minibus to Visegrad. 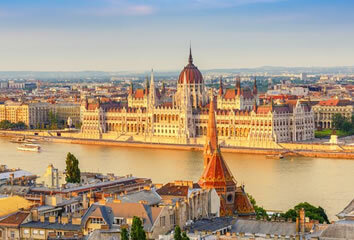 • Explore Hungary`s history along the Danube river. Visit Visegrád and the 750 year-old ruins of the formal Royal Residence. • Learn about life in the Middle Ages and enjoy the panorama of the Danube Valley. • Lunh on your own. • Continue to Esztergom, considered the Northern gate of Budapest and the center of the Catholic church. • Visit Hungary's largest cathedral, a resting place of famous Hungarian cardinals. • Buffet Breakfast and departure by private car or minibus to Gödöllo and to the summer palace of princess Sissi – breath of the Hungarian-Austrian Monarchy. • The royal palace – a beautiful Baroque building - and its large park with horse stables and Riding school was built in the 1800’s for the wife of the Austrian Emperor. Have pictures taken in contemporary dress/suits. • Continue on to Eger for lunch on your own. • Visit the ruins of a XIVth century fortress, with some information about the Hungarian battle against Ottoman Turks in the XV th century. • Also visit the beautiful city of Eger. • Continue your visit the Valley of Beautiful Women, taste wines from Eger’s regional winelands. Eger is great Hungarian wine countryside and visitors can sample local wines at the many local wine cellars. • Dinner on your own and overnight stay at your hotel in Budapest. • Buffet Breakfast and departure by private car or minibus to Héviz. • The Lake of Héviz is the largest biologically active, natural thermal lake of the world, the bottom of the lake is covered by mud, which used for medical treatments and packing. Effective healings for various types of medical problems such as Autoimmune, gynecological and dermatological problems. • On the way stop in Balatonfured, Tihany and Keszthely, all cities near Balaton lake. • Visit Keszthely city and Festetics Castle, XVIII c. baroque. • Continue to Balatonfured, the capital of lake Balaton, the largest lake in Central Europe. The most common words that describe this city are history, culture, wine, and hospitality. • Carry on to other place on the west side of Balaton – Tihany, see the old Benedictine abbey and monastery, which was founded in 1055, then walk around the village. • Lunch on your own in the area. • Dinner on your own and overnight at your hotel in Héviz. • Buffet Breakfast and free time in the city of Héviz exploring the idyllic landscape, the charming villages and the lake. Lake Balaton is a freshwater lake in western Hungary. It’s a major holiday destination with beaches, volcanic hills, resort towns and high-rise hotels along its 197km shoreline. The hilly north shore is a wine-growing region, with protected wetlands and hiking trails at Balaton Uplands National Park. • In the afternoon, enjoy a Balaton lake boat cruise. • Buffet Breakfast and departure by private car or minibus to Pécs. • Founded as Sopianae 2000 years ago by the Romans and known as Fünfkirchen by the Germans, today’s Pécs is a pleasant small (but still one of the largest in Hungary) university town. In 2000, the Early Cristian Necropolis of Pécs was inscribed on the UNESCO World Heritage list. Pécs was one of the European Capitals of Culture in 2010. • In the afternoon free time to explore the city, see the world-famous Zsolnai porcelain/ceramic manufacturers first established in the 18th century. • Then back to Budapest. • Breakfast in the hotel and transfer to the Budapest airport. Star City Hotel is located 400 m from both the neo-romantic City Park and the Keleti Train and Metro Station of Budapest. The hotel provides free WiFi throughout. Overlooking either the inner courtyard, or a quiet side-street, rooms at Star City Hotel are equipped with flat-screen TVs with satellite channels. Air conditioning is standard and adjoining rooms are available upon request. Breakfast is served daily and an in-house bar is available for drinks and lattes. Staff can advise on nearby attractions and each guest receives a free welcome map of the city upon arrival. The elegant Andrassy Avenue is only a 10-minute walk from the Star City. The nearby metro stop gives direct access to Budapest city centre. Hotel Erzsébet is located 350 m from the main entrance of the famous thermal lake of Hévíz. It offers fine Hungarian cuisine, its own spa area and underground parking. All rooms at the Erzsébet hotel have a private bathroom including a bathrobe. Free Wi-fi is available in the entire hotel. Hungarian specialities and international cuisine can be enjoyed in the restaurant or on the charming terrace. The hotel's spa facilities include an infra-red sauna, a Finnish sauna, a steam bath and a hot tub. Various beauty and health treatments are available on site.